How do we reconcile Taiwan’s recent parliament occupation to protest the Cross Strait Service Agreement with realism? With international spotlight on Ukraine and Russia, this blog post would like to turn towards what is happening in Asia, particularly Taiwan (Republic of China). On 18 March 2014, a group of students stormed past police and occupied the Taiwanese parliament. This is the first time in Taiwan’s young democracy that its citizens have occupied its parliament, and the event is still unfolding as this blog is written. Image courtesy of the Diplomat: Inside Parliament. 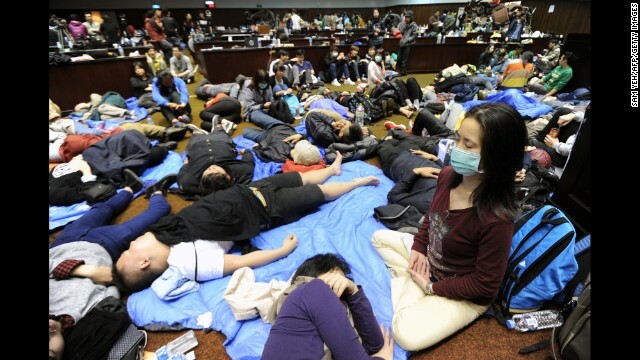 Image courtesy of CNN: Taiwanese protesters occupying parliament. What was the nature of these protests? How can we make sense of them using international relations theory? These protesters demand that the Taiwanese government reject a trade deal signed previously between Taiwanese and Chinese government (yet to be ratified by parliament) earlier that year, which many deem as unification by stealth. They claim that the deal would benefit large businesses at the expense of Taiwan’s small and medium sized businesses and would allow China leverage over Taiwan, hence undermine Taiwan’s sovereignty. The protest has both substantive and procedural elements to it, claiming the agreement is both damaging and unconstitutional. The focus of this blog post will be classical and structural realism: knowledge of the three assumptions and six principles will be assumed. Is Taiwan or should Taiwan be considered a country, and how does it inform our understanding of realism? Realism is based on three key premises: statism, survival and self-help. This is not a piece advocating or opposing Taiwan’s moral status as a country, but rather what this ambiguity means for political theory. Statism argues that states are the primary actor, and all other actors and concerns are subsidiary. This question therefore is an a priori enquiry, before any further questions on the applicability of realism can be considered, and thus carries normative weight, and not just the descriptive value of theoretical modelling. For example, when we say ‘Russia is merely reasserting its sovereignty over Crimea’ versus ‘Crimea seceded from Ukraine and ceded sovereignty to Russia in accordance with the will of the people’, we are making different value judgments despite the “act” being the same. The key here is to highlight the nexus and the tension between the purported neutrality and amorality of realism vis-a-vis its prescriptive implications. Therefore, applying realism and assuming the condition of anarchy, and that power is sought to preserve the state, communists and nationalists who wish for unification, would see Taiwan as a renegade province. Therefore in this case China would merely be reasserting its sovereignty over or exercising jurisdiction and leverage over its own territory (not unlike a fiscal union or federalism over an highly autonomous region, or China’s one country two systems with Hong Kong) – realism would appear to be a non-starter, or at least one where it is only one state consolidating power internally . On the other hand, if Taiwan is deemed a state, it would be a bilateral agreement for mutual gain. The takeaway from this is that, before we can ask why a definitional assumption is or should be applied, we must ask how to apply it. Image courtesy of CNN: Chinese business cards photographed by protesters after occupying one of the Taiwanese minister’s office. How does economic cooperation fit into the framework of realism, and how do variables such as sovereignty, treaties and international institutions affect this? International relations theory often focuses on military conflicts, but how does trade fit into the framework of realism? If we accept the three premises of Statism, survival and self-help and the assumption of anarchy, is trade prima facie an objection against realism and an affirmation of the cooperation and institutions central to liberalism? Not necessarily. This critique is often made because realism is often associated with mercantilism or economic nationalism. However, that politico-economic relationship need not exist. Consistent with realism, Taiwan could be acting to ‘help’ itself in an ever competitive global market. Moreover, if we take anarchy, self-help and survival to its logical extremism, states would regress into autarkies. This would of course be a misrepresentation. The more nuanced approach would be to consider Taiwan’s trade deal with China as one that is necessary under structural realism, one that might be regrettable, but the trade-off of any sovereignty is required because of the incentives that exist in a world which needs to trade with China. We can see this by other counter-balancing moves by the Taiwanese government, for example recent free trade agreements with New Zealand and Singapore, and efforts to join the TPPA, as well as the fishing agreement reached with Japan in the Senkaku, in an attempt to balance against China’s growing leverage and clout. Image courtesy of Reuters: Ma-Ying-Jeou addresses press on the importance of the Cross Strait Service Trade Agreement. Of course we could argue that there are other historical and ideological reasons for this trade agreement, for example unification. However that is beyond the scope of this discussion. Non-state actors, such as corporations and protesters, appear to be influencing state decision-making, how can this be reconciled within our understanding of realism? To briefly cover this, even if corporations were lobbying the Taiwanese government to sign the trade agreement, the chief beneficiary would still be the Taiwanese state which relies on the activity and scope of these companies to compete with conglomerates such as South Korea’s own chaebol. Accordingly, it is still in the state’s best interest. Image courtesy of BBC: Citizens barricading themselves against state police. President Ma-Ying Jeou also spoke publicly about the protest, saying the agreement is too important for Taiwan, thus the actions of protesters appear to be minimised. This blog explores three theoretical underpinnings of realism in relation to one of Taiwan’s contemporary events: firstly, how do we define the boundaries of realist enquiry, for example what a state is; secondly, what is the relationship between trade and realism; finally, how non-state actors such as corporations and protest movements operate within a realist framework. This entry was posted in Asia Politics, Democracy, International Relations and tagged Asia Politics, China, Civil Liberties, Democracy, Taiwan.